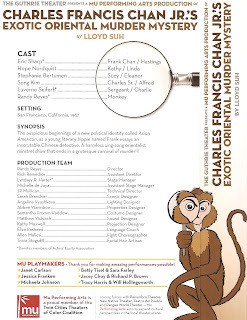 The play takes place in 1967 and moves between two main stories, that of young playwright Frank Chan (a fictionalized version of playwright Frank Chin) and his wife Kathy (an ode to activist Kathy Change, who was married to Chin for a time), and the play that they're writing, titled Charles Francis Chan Jr.'s Exotic Oriental Murder Mystery. 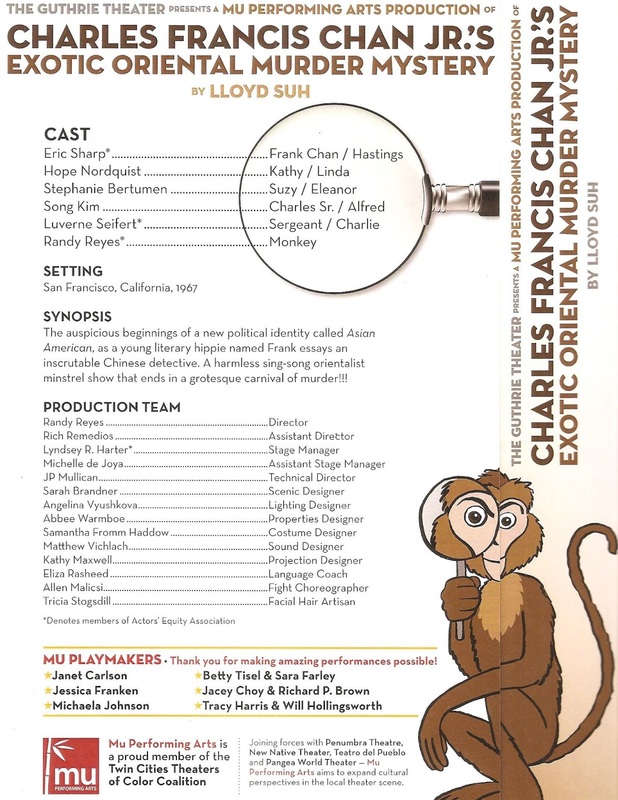 As both stories unfold simultaneously, we see that everyone in Frank's life plays a role in his play, including older brother Charlie, ex Suzy, and a white parole officer who plays the stereotypical detective in yellow face, while the Asian Americans (a new term in 1967) portray the white characters in the play. In addition to commenting on society, Frank is also working out some issues with his father, a former Peking opera performer who gave the white audiences the stereotypical show they expected (see also Flower Drum Song). Oh, and there's also a talking Capuchin monkey who appears to give Frank advice. Like I said, trippy - it is the late '60s, remember (of which Samantha Fromm Haddow's groovy costumes will remind you). Particularly memorable moments are watching the silent process of a white actor donning yellow face, complete with eyebrow pencil, fake mustache, and yellow powder; and a montage of images of Asian Americans in cartoons and movies, along with discriminatory signs, and a few historical photos of real people, in stark contrast to the grotesque way they're often represented. Director Randy Reyes has assembled a fantastic cast (including himself, providing comic relief as the monkey, something he does well). The talented Eric Sharp gives perhaps his best performance yet as Frank Chan, balancing the line between the aimless young man of the late '60s and the artist who really wants to make work that matters. He's well-matched in Hope Nordquist as Kathy, who has her own path to travel. Luverne Seifert as the yellow faced detective is both funny and disturbing as he embraces the stereotype fully. Song Kim and Stephanie Burtumen are also great in a number of roles, wigs, and accents. Charles Francis Chan Jr.'s Exotic Oriental Murder Mystery continues through May 28 in the Guthrie's Dowling Studio, where tickets are just $9. It may feel a bit too long in parts (and there's one awkward moment when the house lights come up and the audience is asked a question that no one answered, because this is the Guthrie and we're Minnesotans and we've been trained not to talk in the theater), but the play provides some really important commentary on Asian Americans in popular culture in a wild, funny, entertaining, poignant, and at times shocking way. There are a few talk-backs throughout the run, and a dance party (if that's your thing), so be sure to check out the Guthrie's website for the schedule of community engagement activities.